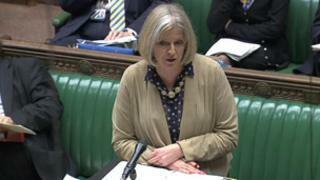 Home Secretary Theresa May has rebuked Tory MP Dominic Raab who accused feminists of "obnoxious bigotry". Mrs May, who is also minister for women and equality, said Mr Raab was fuelling "gender warfare" - to cheers from MPs. The MP was asking Mrs May a Commons question about government plans to introduce shared maternity leave. He provoked a storm of protest in an article for Politics Home in which he said men were now the victims of "flagrant discrimination". Mr Raab said men had a raw deal in the workplace, working longer and being at greater risk of losing their jobs. He told the BBC it was sexist to claim men had caused the recession and "equality had to cut both ways". Labour said the comments showed the Tories were out of touch and progress in equality was under threat. But the Esher MP was slapped down by Mrs May when he raised the issue of maternity leave at equality questions in the Commons on Thursday. He said: "Making maternity leave transferable would help eliminate anti-male discrimination in the workplace and give couples greater choice about how they address work/life balance together." Mrs May agreed that flexible parental leave would "give families the choice to decide which parent wishes to stay at home to look after the child in the early stages, beyond a period which will be restricted for the mother only". She said it would also mean that "in future the employer will not know whether it's the male or the female who is in front of him for employment who will be taking time off to look after a baby". "I think that's an important step in dealing with discrimination," the Conservative minister told MPs. "We should be trying to get away from gender warfare and the politics of difference - but I might suggest to him labelling feminists as obnoxious bigots is not the way forward to do that." Ms May said the coalition would shortly be launching a consultation on its proposed legislation to promote "shared parenting".